BEHIND THE SCENES: INSIDE OUR FACTORIES . The fashion industry is notorious for it’s ‘closed door’ nature, especially with regards to the supply chain and sharing of information. There are also many misconstrued assumptions and stigma attached to Far East manufacture. In this post, I would like to address some of those assumptions and shine a light on some of the really great attributes sourcing out of China can offer. I’ll also give you a sneak peak at some of the factories Farrar Studio has the privilege of working with. PROS FOR MANUFACTURING IN CHINA. Production in China is set up on an efficiency model, so the higher the quantity the more efficient the production line becomes. 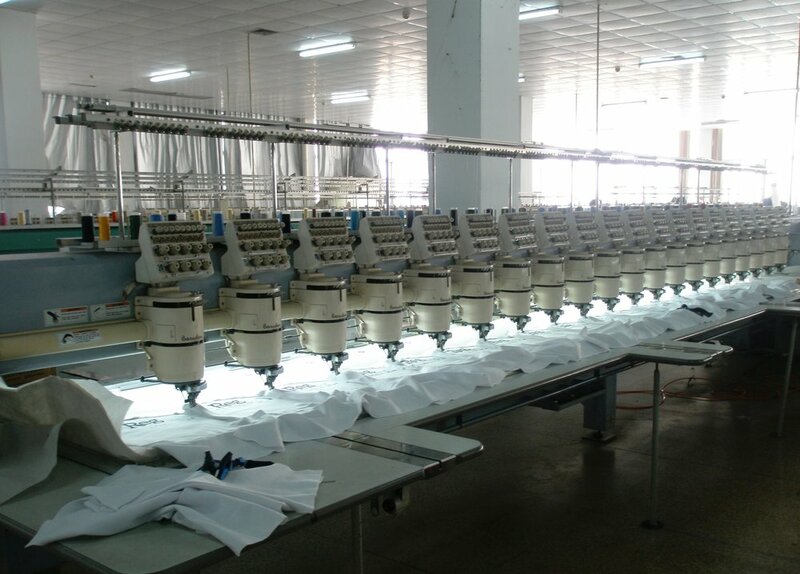 Some of the factories Farrar Studio is partnered with are set up to tailor for mass production and they use electronic hanger systems to transport a garment along the production line, increasing efficiencies and allowing more capacity. It’s no secret that finding a reliable manufacturer is one of the toughest challenges brands and retailers face. However, Farrar Studio has a structure which removes the worries of unreliability. With myself on the ground here in the UK, I communicate with my partners in China who translate and triple-check every detail with the factories. With a working relationship spanning 10 years, there is unconditional trust within our working relationship, something that we pass onto the customer. It is often assumed that production out of China is cheap and poor quality, and in some instances, this may be the case. It can also be true in European and some UK factories. Over recent decades, China has responded to huge pressure from their Western customers, demanding lower costs and better quality which has resulted in an incredibly skilled workforce with access to new techniques, technologies and processes to develop new styles. Throughout the sampling process, we will iron out any issues to make sure the best quality is delivered. Once samples and sealed, approved and on the production line, each item is checked throughout the production process. On completion of production, we have qualified QC’s who complete a selected check and produce a report before the goods are delivered from the factory. Of course, given the nature of the industry, no one is 100% perfect 100% of the time, but Farrar Studio and it’s partners do everything humanly possible to ensure the highest standards are met. Producing in China will usually provide lower costs per unit, this is due to the high efficiencies mentioned in point 1 and a large workforce. But with this often comes higher MOQs (minimum order quantities). For start up brands, this isn’t always workable, but for existing brands who are looking to grow and need a supply base which can cope with the capacities, China is a great option. If you are used to on-shore production, sourcing out of China will involve adjusting your critical path, for example, factoring in time for shipping. Often large quantity orders will be shipped by sea which can take 4 weeks. One of the benefits of producing out of China, and one that I really loved when I was a designer in my earlier career was having the option of fully-factored manufacture. Having the entire production process under one roof was really usefully in making moves towards being vertically integrated. It’s also great for developing fabrics and trims that are unique to your brand. Rather than having different suppliers for every element of a product, which can be really time consuming and a logistical nightmare, it’s all taken care of. SNEAK PEAK: INSIDE OUR FACTORIES . Unless you’ve spent a lot of time visiting your suppliers and manufacturers, it can easily be overlooked what it’s like behind the scenes of the supply chain. I’ve worked with designers in the past who have never been to a garment factory, which blew my mind! It’s so important to have an awareness of how things work on the production line. Here are a few photos from a couple of the factories we work with. I would love to hear about your manufacturing experiences, do you have any horror stories, or any real successes? Please comment below and share your stories. Newer PostTOP TIPS: MAKING THE MOST OF TRADE SHOWS . Older PostLAUNCHING THE FARRAR STUDIO BLOG .